Happy new year to everyone! This month we're going to take a look at some of the trends in drapery, bedding, and pillows Here, you see a lovely mix of color, texture, shapes and pattern. The neutral sofa acts as a wonderful backdrop to to the drama created by the textiles. What is nice about this is, that if you tire of the look, it is easily replaced with other colors at a small expense. The photos below show how you can elect to trim your pillows with your own designs, with the use of decorative tape. Here is a Greek key design. you can also elect to applique part of another fabric on to the face of a pillow. The applique need not be the whole print! You may edit a design and select only portions of the fabric to highlight. Pictured here top and bottom are some of the new color combinations, soft taupe/gray with the muted pale yellows. Don't be afraid to mix patterns, the chevron upholstery and the applique work nicely together here. Below you are looking at a roman shade with beaded trim. a detail like this adds a nice touch. 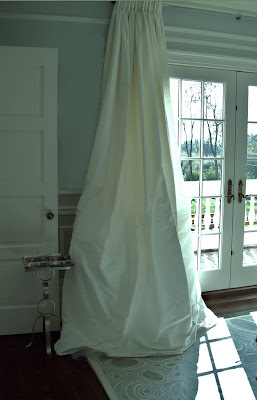 Next, consider using fabrics with lots of volume for a dramatic effect. Certain silks are full of volume but are light and airy at the same time. This shirred side panel reminds me of a wedding gown. How about this for a woman's study or bathroom? The next set of photos takes a close look at bedding. These are soft and serene traditional and contemporary. 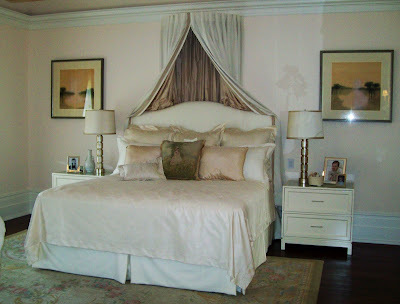 Notice the canopy, you can create this look easily and coordinate it with the pillows. 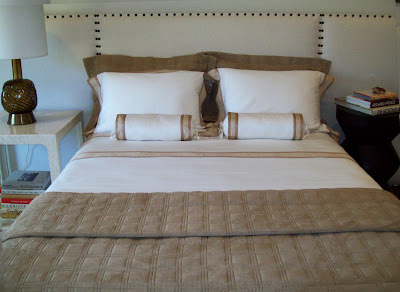 The largest pillows are called euro shams and using them first is a great way to begin building your bed ensemble. Notice the inverted pleat duster, tailored yet soft. Fyi... your sleeping pillows can hide behind the euros! This bedding incorporates wonderful shades of dusty blue, very restful. Benches at the end of a bed not only look great, but it's a great place to store pillows and extra blankets at night. Notice the upholstered headboard, another great way to incorporate color with your bedding. The last bed here is more contemporary, very sharp with the use of the bolster pillows. Look how just a small amount of banding at the end of a pillow can pull a whole look together. If you are interested in going back and reading any of my other blogs, feel free to go to www.merlehillaryinteriors.blogspot.com You can go to the blog archives on the right side of the page. In the meantime, feel free to tell me what you think, I love reading all the comments.